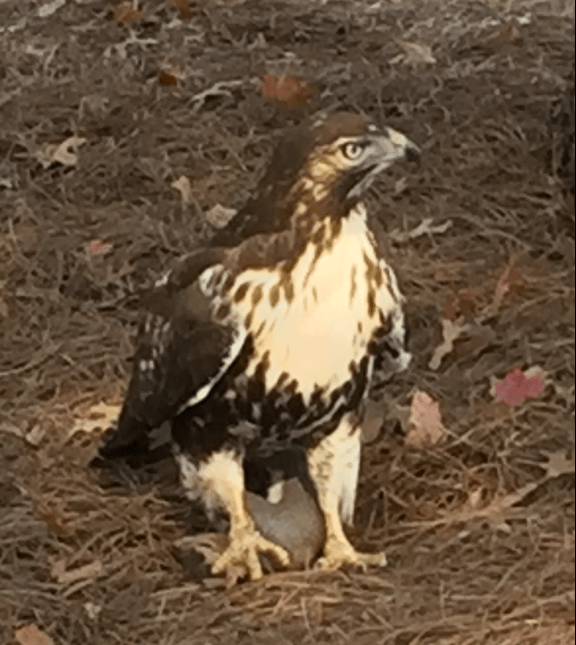 While delivering packages to Burgin-Dossett Hall on Wednesday, Joe Shuffler saw something that few people get to see up close: a red-tailed hawk eating a squirrel. Fascinated, Shuffler took out his phone and shot some video of the hawk, which was sitting contentedly under a tree. The hawk appeared to be relatively unconcerned about the small group of people that had gathered around to observe its behavior — at a reasonable distance. “I’ve seen nature programs … but when you actually see that live, it’s really fascinating,” Shuffler said. Although red-tailed hawks are among the most common hawks in North America, Fred Alsop, a professor in the department of Biological Sciences at ETSU and a local bird expert, said that it is quite rare for people to have the chance to see one up close. ETSU, however, does offer a relatively welcoming environment for the hawks. The mammal population on campus in particular provides an enticing hunting ground for the hawks, especially if they’re hungry for squirrels. And red-tailed hawks aren’t the only birds of prey on campus. Grey-horned owls nest in the area, and Alsop said he has spotted Cooper’s hawks, which eat birds, on campus as well. Occasionally, bald eagles have also been reported flying over campus, and last year, ETSU managed to set up live feeds of two local bald eagle nests. Although the red-tailed hawk that Shuffler saw on Wednesday was relatively young, there are also a couple adult red-tailed hawks that are permanent residents on campus. They tend to rile up the crows that also call the surrounding area home. Shuffler said that the young hawk that he saw on Wednesday was unperturbed by his presence and continued to eat the squirrel without concern.